$550.00 High quality unissued officer boots in black leather, with quality control stamps dated 1927-1928. Perfect for completing a display of almost any early Soviet or WW 2 officer's uniform. About a US 6 ½. $150.00 Officer shoes, late 1940s through 1950s. Excellent quality, unissued. $90.00 Officer leather leggings, circa 1930s. $135.00 Felt burki boots, 1940s-50s. Excellent condition. $109.00 Felt burki boots, 1940s-50s. $130.00 Army officer leather belt with open face chromed steel buckle, dated 1944. Large size, will comfortably fit up to size 36 waist. In very good condition, with "healthy" leather and perfect finish on the buckle. $195.00 Army officer leather belt with open face chromed steel buckle, c. early 1940s. Large size, will comfortably fit up to size 38 waist. In excellent condition. Includes a post-war shoulder strap. $155.00 Army officer's leather belt, WW 2 era.Two-pronged brass buckle with roller. $125.00 Very early 1930s EM/NCO leather field belt with steel buckle, very narrow 1.25" width. $445.00 M 1940 Waist Belt with Hangers for Navy Officer Dagger, 1940- 1947. Early, narrower pattern, featuring so-called "kind lions" on the buckles and without the larger round buckle up front. In excellent condition. Fits up to a 42" waist. This rare and desirable WW2 model is a perfect accompaniment for a wartime-dated dagger. $45.00 Grade school student's uniform belt and buckle circa 1940s-1950s bears the Cyrillic letter "Sh" for school. $8.00 Leather straps for cavalry spurs, circa 1940s. In black leather with steel buckles. Price per single piece. $115.00 Officer's leather map case, larger size, circa mid to late 1930s. Pre-Patriotic War version in high quality leather, complete with original shoulder strap and insert for pencils. In very good condition. $65.00 Leather caps for PU sniper scope, as used with Mosin-Nagant sniper rifle, circa 1940s. $485.00 M 1938 canvas rucksack, circa 1939/40, type with leather shoulder straps - before the introduction of the almost all canvas version. $475.00 M 1936 military issue Knapsack with rigid frame, mid to late 1930s. $65.00 Tokarev SVT-40 ammunition pouch, dated 1941. In brown pigskin and leather, clearly maker stamped and dated. In very good to excellent condition. $20.00 Canvas pouch for PPSh SMG drum magazine, simplified wartime version, early 1940s. In excellent unissued condition. $25.00 Canvas pouch for PPSh SMG drum magazine, simplified version in olive green canvas with toggle closure, circa early 1940s. In near mint unissued condition. $20.00 F-1 grenade pouch in smooth olive drab canvas with wooden toggle closure, early 1940s. Nicely marked by the 20th Anniv. of VLKSM Factory in Moscow. In excellent unissued condition. 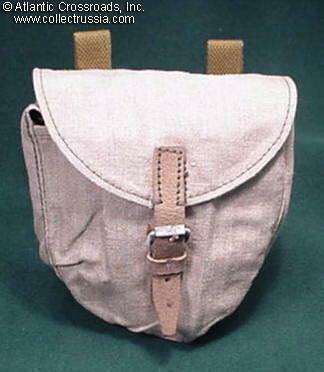 $9.00 F-1 grenade pouch in gray canvas with wooden toggle closure, early 1940s. In excellent condition, unissued WW2 Soviet military surplus. $70.00 RPD Degtyrarev Pekhotnyi (Infantry) light machine gun drum magazine carrier, circa 1944. In sturdy canvas with canvas shoulder strap; uncommon version with steel buckle closure. Very good to excellent condition. $450.00 Trench Periscope (or "Scout Periscope") as used by forward observers and sniper teams to enable them to see without being seen. Undated model with early issue hard carrying case - probable arsenal rework of a wartime 'scope; very clean 4x optics with scale grid. $1,250.00 Soviet Navy Star Globe in original Wood Case. 1941 dated navigational instrument as used on Soviet submarines for nighttime navigation. Very scarce and attractive naval item with highly desirable early wartime date. $275.00 Red Navy oval plate, 1930s. Blue anchor and Cyrillic abbreviation "RKVMF". Blue border. $180.00 RKKA (Workers and Peasants Red Army) Mess Hall Dinner plate, Dmitrovskaya, 9 1/2" in diameter, 1936-1941. In very good condition. $195.00 NKVD Mess Hall Sugar Bowl, mid to late 1930s. Shows red star and GUVS-NKVD decal. Maker marked "Proletariy MSTA" on the bottom. Missing the lid, otherwise in very good condition. $80.00 Red Army Military Issue Field Compass, dated 1940. Uncommon simplified wartime version without the brass sight. In excellent condition. $45.00 WW 2 personal identification capsule - the Soviet equivalent of a dog tag. Circa 1930s-1941 manufacture. $10.00 Military issue map case protractor, dated 1941, with original paper envelope. Mint. $60.00 "Trench Art" WW 2 brass cigarette lighter, smaller but rugged and well made. $45.00 Soldier-made WW 2 "fuse" shaped brass cigarette lighter. $60.00 WW 2 brass cigarette lighter. $85.00 WW 2 bullet shaped brass "Trench Art" Soviet cigarette lighter.